I'm super excited! My sister Melissa just sealed the deal and is coming to Silver Bella! For a long time she's been kicking herself for missing out on getting a ticket. When all the tickets sold out I was bummed because I thought it would be really cool if she went and she'd be my second line of emotional support on my dreaded first airplane flight. Well, things ended up working out. My new friend Sharon McGinn has tickets but unfortunately is unable to attend so Missy was able to purchase hers. And a word to anybody else who missed out: Sharon has one more ticket available and she'd love to sell it to an aspiring Bella! Go to her blog to let her know if you're interested, or stop by even if you don't need the ticket because her blog is a scrapbooking treasure trove of classes and sources! She owns a fab scrapbooking store in Massachusetts and she asked me and Aar to go up and teach a class after the new year. We're definitely gonna take the road trip up there. 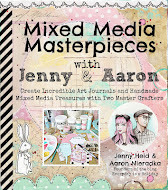 I'm psyched to meet her and see her shop in person! So again, if you want a ticket, here's that second chance! This second ticket was Sharon's daughter's and it's the same schedule as the one she sold my sister so you can chill with Missy when you're out in Omaha! Above is a little afternoon tea party we had today. Just me, Aaron and little Carlos. I have to say that mini cupcakes go down way too easy. You can eat 'em like M&M's. Check out those cupcake toppers! The adorable plastic flowers are from A.Bell Emporium which, ummmm, oh my, if you're looking for fun cake toppers look no further, cause Amanda rules!! Kitsch Deeeelux! You got your bunnies, your gnomes, record players/records, mini boom boxes...good stuff! 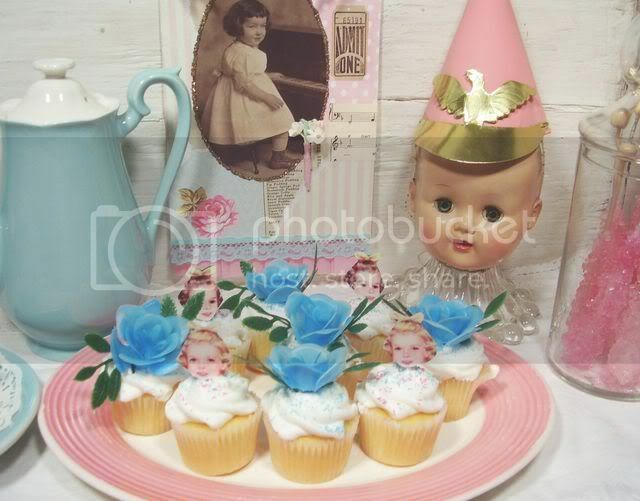 Also she supplied me with these super duper sweet vintage plastic party favor cups. I looooove them! She knows me all too well! What a doll she is! Thank you SO SO much Amanda!!!!! 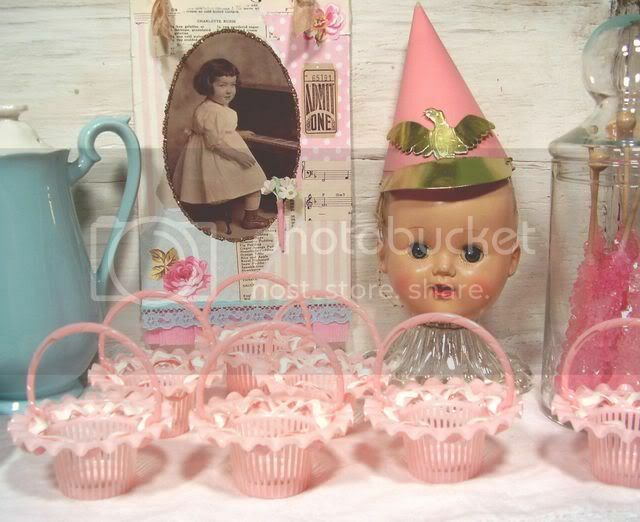 And those other cupcake picks with the little girl heads are like my favorite things right now! 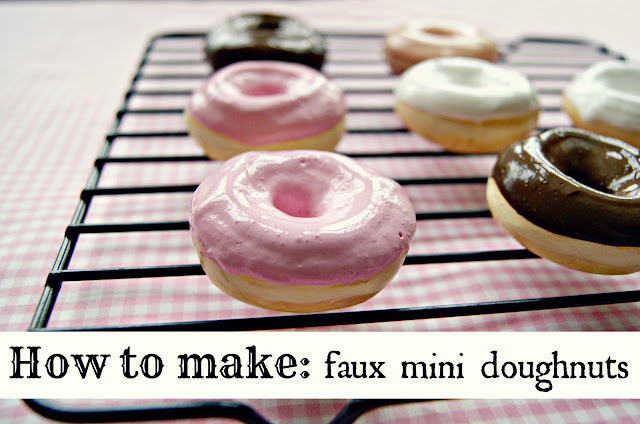 Besides looking pretty atop a swirl of buttercream I can see these working in all sorts of crafting projects. They're handmade by Laura at KatyDid Designs. Her motto is: “If it stands still it can be embellished.” (well my cupcakes were standing still when I embellished them with Laura's girly picks, but soon after that they were moving fast toward my mouth!) Well take a look at katydiddys. 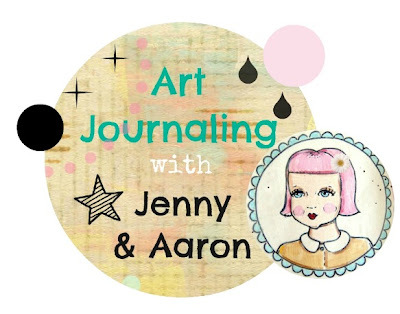 She's got a free monthly, electronic newsletter that features her latest artwork & tips and tricks for running YOUR craft business! 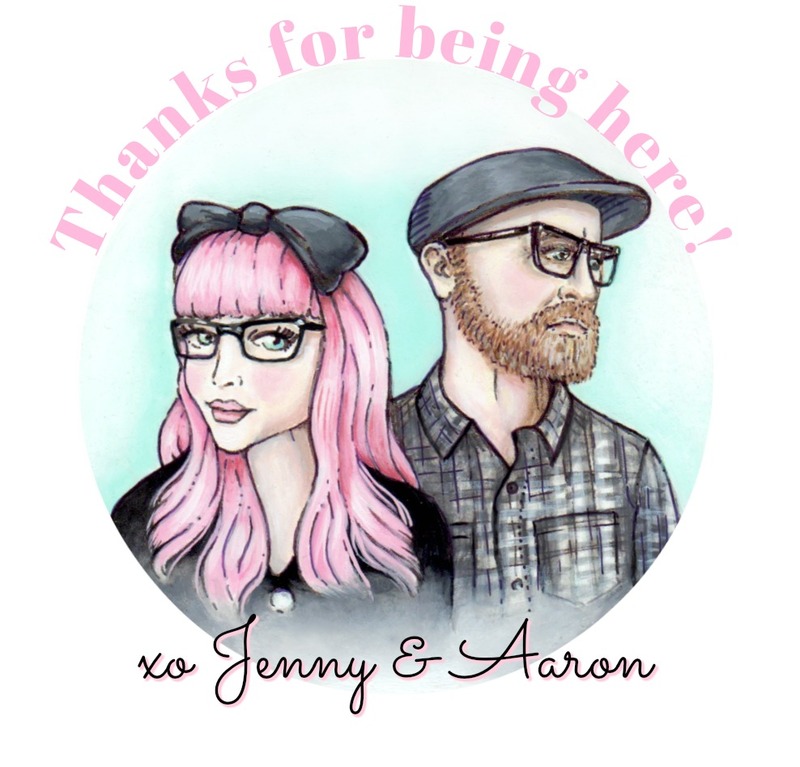 It's a very cool blog and the newsletter has lots of quotes and advice from Laura and a lot of her successful artist friends. Ok, just wanted to check in. Thursday is our hump day since our official workweek sorta ends on Saturday night. So nothing much else to report except that it looks as if we might still have an existing sun in Jersey. After four days of chilly rain we're finally clearing up...unfortunately it means that the true August is coming back for it's last hot hurrah. I'm so done with heat! Now, that precious lil piece w/the girl in the oval and the new wallpapers and the ticket. Have you introduced us to that yet? If so I missed it...it is adorable! Have a great weekend Jenny! Thanks for the mention Jenny. Everything looks wonderful when you put your special touch on it. Those dollies look fab with the flowers! Maybe Amanda and I should get together and collaborate! Always such pretties to view over here. Charlotte is amazing. I knew she would be. I'm so glad you were nominated for the "nice matters" award. You, Jennifer Paganelli and Kari Ramstrom were the first people I thought of when I saw that award starting to float about. I would have nominated you, but when a friend told me she was going to nominate me, I declined because I don't want to diminish the award. I think it's really important that it be true! Not that I'm not nice, I just don't have the time, the energy or the high speed to do much blogging so I don't really deserve the award. Ya know?? You, however, really deserve to be in the number one spot of the bloggers I know! Thanks so much for your amazing support of blogland! Beautiful photo shots. Love the arrangements, colours and the subject matter. I am so glad your sister gets to come to Silver Bella! My sis and I are really looking forward to meeting you guys! I love those cupcake toppers, too much fun! I was just checking to see if the ticket is still available! Very interested! By the way, your stuff is great! thanks! LOVING the mini cupcakes! Knowing me I would have scarfed them all and justified it to being that they are all so small. LOL! Kinda like the miniature chocolates. hee! hee! Hi Jenny, I am making my way out of lurkdom and actually commenting. I adore your things. I love your artwork with the little girl and the ticket. Too cutie. I also loved the glass jar with the pretty pink rock candy. Amy H.